Innovative Stamp Creations is the sponsor of CPS117, and the ISC Designers are playing along with this weeks sketch. I've always loved the look of Cameo Coral and Black and used this weeks CPS Sketch to incorporate them into my card. I used the Heavenly Holes Technique from the soon to be mailed June TJNL on my Flourish and the Spectrum Roll Technique on my Butterfly. The Flourish and Sentiment are from the ISC plate Fansy Designs, the butterfly is from ISC Collage of Leaves. Be sure to hop over to the CPS Blog to play along with this weeks sketch to be entered to win some great products from Innovative Stamp Creations. 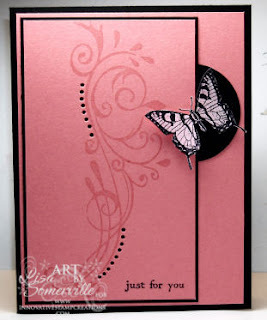 Very pretty, great layout and the "holes" do add a lot of interest to the card! Very, very pretty! I'm intrigued by the Heavenly Holes technique.